I have stated this before, but for reasons which may become clearer in the coming days, I remind you that Apprising Ministries has always been a fully integrated auxiliary from Connecticut River Baptist Church (SBC), where I serve as pastor-teacher. And as I’ve also mentioned previously, even though my local church is affiliated with the SBC (for now), this online apologetics and discernment ministry itself—which serves as CRBC’s website—is designed as a non-denominational outreach. Truly we never envisioned being among those who’re also pioneering this important Internet mission field. You may know that in Apprising Ministries On Dan Kimball, I reiterated the well known fact that I am certainly no friend of the sinfully ecumenical neo-liberal cult of the Emerging Church aka Emergent Church, and the awful impact that these rebels against the final authority of the Word of God are having upon the church visible through their postmodern Progressive Christian theology—a Liberalism 2.0—often referred to now as “big tent” Emergence Christianity. Keeping this mind, you likely know that I’ve also brought it to your attention when Christian apologist Chris Rosebrough, host of the Fighting for the Faith (F4tF) program on Pirate Christian Radio, announced he had a lengthy meeting with EC leader Dan Kimball, which he later discussed on his F4tF. I’m not on Facebook, but I have been receiving a number of phone calls and emails informing me of a controversy that apparently has arisen around some of the things Rosebrough has said concerning Kimball after a subsequent interview he did last week with him. What’s also important to understand here is this: For at least three years now, I’ve also personally been conversing off and on with Dan Kimball—who even wrote me today—via email and a few phone calls, the contents of which he’s asked me to keep off the record. This is a large part of the problem because Kimball also told me over a year ago what he tells Rosebrough. Regardless of where he may, or may not, be now it’s simply beyond question that Kimball was indeed among those in Young Leaders Network involved with the EC right from very early on when Leadership Network launched it. My guess is that this insertion by Kimball into his post entitled A call for Christian discernment web sites to lovingly discern each other will turn out to be a tactical error on his part. However, be that as it may, following below is a transcript of the aforementioned interview for your examination as to just what Dan Kimball has told Chris Rosebrough about his own theological beliefs, and about discernment websites. It’s time, for another addition of Fighting for the Faith; Monday, November 15, 2010. Get your thinking caps on, it’s interview day today. Thank you for tuning in, you’re listening to Fighting for the Faith. My name is Chris Rosebrough, and I am your servant in Jesus Christ; and this is the program that dishes up a daily dose of biblical discernment; the goal of which, help you to think biblically, help you to think critically, and to compare what people are saying in the name of God to the Word of God. There is no shortage of crazy things being said out there in the name of God; and we cover them here, and well, use the Bible to offer a corrective. Now, today’s edition of Fighting for the Faith, will be a controversial edition and the reason why it is—why it’ll be controversial is because, ah, I have, ah, an interview that I’ll be playing that I recorded earlier today with Dan Kimball. Dan Kimball is the, ah, pastor at Vintage Faith Lutheran—not Lutheran—Vintage Faith Church in, ah, Santa Cruz, California. And, ah, he is, ah, one of the guys who early on was part of the “emerging church conversation,” and, ah, last week I created controversy—not intentionally but I knew it would be controversial—controversy, ah, regarding the fact that, ah, I met with Dan, spent six hours with him—we went to the, ah, grave of James Dean—and we talked, ah, quite a bit theology in that amount of time. And my assessment after coming back, and meeting with him, was that, ah, what we’re dealing with in Dan Kimball is a gentleman who is a brother in Christ; that he (pause) preaches, teaches, and confesses, historic orthodoxy. Does that mean, that ah, that I agree with all of his methodologies? No. Does that mean that if we have a difference of opinion as to what the Scriptures say, and teach, regarding, ah, the methodologies that we are to approach him as a Christian brother? That’s exactly what it means; it means we approach him as a Christian brother. Now, ah, when I posted that information up, ah, there was, ah, a bit of controversy that occurred on my Facebook wall. Dan saw it, and ah, and asked if he could help; and I said, “Sure, I think a way that you could help would be if you came on the program so that people can hear from you, yourself—in your own voice—what you believe, teach, and confess.” That being the case, you need to understand that the purpose of this interview was not to address every single issue, ah, brought up by the Emergent Church or every single question, ah, regarding everything that Dan has written. The purpose of this interview was really to focus in on, and give Dan an opportunity, for him to say what it is that he believes, teaches, and confesses; and during the interview Dan does that in spades. There should be no question at the end of this as to what—ah, as to what Dan Kimball says that he believes, teaches, and confesses. And Dan also, ah, took some time to offer his thoughts and opinions, ah, regarding the need for discernment in the discernment camp; and ah, and ah, he spoke regarding his own experiences there. And ah, and so, I-I-I think you’re going to get, ah, you’re going to get a program today that, for some of you, might be challenging; for others of you it might be refreshing, for others of you—I don’t know there might be weeping and gnashing of teeth—I don’t know. But what I do know is this, that we are called by Scripture to speak truthfully of others; and if in the process of defending the Christian faith we make errors, then because we’re defending the Christian faith—which tells us that we are to not bear false witness against our neighbors—that we are responsible to Christ with what we say. So, even on this program I take great lengths to exercise discernment in the discernment that I do. Do I pull it off successfully 100% of the time? No. Where I make errors I have to repent and change what I do. 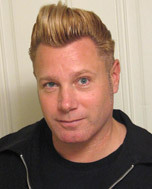 Chris Rosebrough: Alright, on the line I have Dan Kimball of Vintage Faith, ah, Church in Santa Cruz, California. Dan is historically one of the guys who was there in the beginning of the “emerging church movement,” and “the emerging conversation,” going back into the 1990s. Ah, he’s a prolific author and public speaker. Dan thanks for coming on Fighting for the Faith. Rosebrough: Alright, so, ah, you and I—we went to see James Dean, ah, last week. Kimball: Yes, we did; had a great time doing it. Rosebrough: Yeah, and ah, I wanna thank you, ah, publically for uh—first of all—for contacting me and giving me the opportunity to spend some time with you. We ended up spending six hours together; and, ah, an’ part of that was, ah, doing historical site seeing and, ah, a large portion of that was getting to know each other theologically. And ah, I’ve taken some flak as a result of making the public claim, ah, that, ah, that you’re not a heretic, and that, ah, you actually, ah, believe, teach, and confess, historic orthodoxy; so I think that’d probably be a good place to start our conversation. What do you think? Kimball: Okay, whatever is helpful; I will, I will, talk about anything. Kimball: Yeah, [clears throat] I always have, and I’m sure if you ask me—you have to define what this “high view” of Scripture means because most people will say they hold a high view of Scripture. Um, you know, I look at it—the Scripture—as the inspired, authoritative, truthful, Wor—Word of God. Um, and so I guess, um I—absolutely—absolutely do. An’ that’s why we picked the Lausanne Covenant too, cuz it talks about Scripture; it talks about atonement, salvation, some of the, the, core historical doctrines of history—church history. Rosebrough: Right. Well let me read what the Lausanne Covenant says about the authority and the power of the Bible. It says: “We affirm the divine inspiration, truthfulness and authority of both Old and New Testament Scriptures in their entirety as the only written word of God, without error in all that it affirms, and the only infallible rule of faith and practice.” Eh, that’s what you believe regarding Scripture? Kimball: Sure. I mean, I never have changed that; I always look at, you know, what God inspired, ah, through human beings—from the beginning—is, is, exactly what He wanted, in ah, for us to have today; and so, you know, my view has not changed, ah, in most things. That’s what’s interesting, is that probably, I don’t—I haven’t had some, like, some great theological shifts in doctrine or I’m not now repenting back to a, ah, “boy, now I’m believing this.” Ah, I-I-I’ve been pretty consistent; and I just think people have, you know—an’ I say in your circles—have probably not, I don’t believe, have done the right research or, ah, taken the time to ask me—like you have—or, or others, um, to actually ask what do I believe—what does our church teach about this stuff. Rosebrough: So in a sense, ah, they saw that, uh, that, you know, that when your book came out on the Emerging Church in 2003 [The Emerging Church: Vintage Christianity for New Generations]—and there’s a group of people in there that, ah, have a different view of Scripture than you do, but that’s really not the point of this ah, con—of this interview—ah, but ah, they-tha-it seems that people “lumped” you in with them in their view of Scripture. You’ve also contributed to other books that, ah, have been more in the Emergent Village camp, and so I-I can see tha- on the one hand, it would be easy, ah, to put you in that camp. But yet you’ve publically—I mean, an’, an’ ya, you know, I-I saw it in 2008—ah, affirmed a high view of Scripture u-using the definitions of the Lausanne Covenant, which would basically put you in a completely different theological space than many in the—I-I don’t want to say “Emergent” conversation because as, as, as people study “Emerging” then they understand that yo—over the past few years—it’s kind of fractured into maybe five or six different, distinct camps, and so it’s really difficult to pin it down; but you on the other hand, ah, you know, it’s clear that, ah, if you’re affirming the authority of Scripture—and-as defined in the Lausanne Covenant—that we’re dealing with a horse of a different color when it comes to you. Kimball: And that is why, you know, some communication methods—or using art—you know, not in place of sermons, but in addition to sermons—or just, it was re-thinking all of those things, yet still, um, holding onto the core doctrines of historical Christianity in that way. So I think what happens too, is like when Hudson Taylor, you know his story of when he went over to China. Kimball: And, ah, when he got over there from, you know, England, and where he was based out of initially, he then was, ah—he changed his dress, he changed how he looked; he changed, he adopted cultural distinctives of a specific culture, over there, to then teach about Jesus, and, and make disciples. And—cause he then was in that culture—and what—the people that criticized him were the people from his home base that said, “Why are you doing it like this? We don’t understand you.” And then he eventually had to break off and form the China Inland Mission; you know, because—and I think so much in this, at least in my particular case—I think a lot of it was, y’know, looking in and saying like, “Why are they doing this? Why is he using words like this, or whatever; without actually stopping—like you did—and saying, “What is it that you actually teach about in your church? What is it that you are—how do you view Scripture? How do you view atonement? All of these different things; so, ah, I-I think it’s, ah, pretty—as simple as that, and also sad that, I don’t believe people did specific—uh—specific homework on individuals. And ya also have to remember this, back in the early days of the Emerging Church, there wasn’t the controversy; and the controversy was about, “Should you dim the lights? Should you serve coffee?” I mean that was, that was sort of the controversy; the co—the controversial things developed later on, uh, as different people started, you know, viewing more—um, all types of different theological views and pushing different things theologically—that developed later, not in the very, very early years—at least in my personal experience—and then it did develop, for sure. Kimball: But I was not in that group. 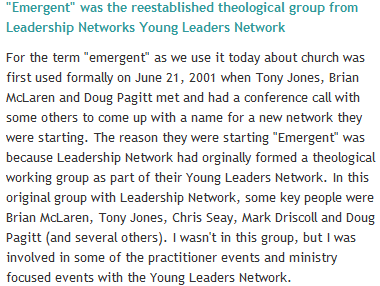 I was definitely involved in, y’know, the practitioner—at that time it was, “How does churches start a alternative worship gathering within their church?” That was my primary, um, entry into it, because we had a young adult ministry of around 800,000 young adults in a sma—rather small town—so it was ho—what’s going on there, and that was sort of my entry into it, because it was—that was my niche—having an alternative gathering within a church for the next generation; how that plays out. Rosebrough: Un-kay. Now, uh, I mean, you and I are both Gen Xer’s—I think. Um, ye—ah, they ah, it was clear in the 1990’s—early 1990’s—it was really startin’ to come out, ah, this, ah, postmodern deconstructionism. Ah, Jacques Derrida, [Michel] Foucault, and others; ah, that, uh—you know, they had a completely—it wasn’t just that they had a different way of looking at the world, but they had a very deconstructive way of, of, ah, looking at the foundations of Western civilization. What was your exposure to, ah, that type of, ah, of philosophical, and deconstructive thinking; and, ah, did you have any answers to it at that time or did you know to reject it? Wha—I mean, what were your thoughts about it? Kimball: Yeah, I-I read, ah—the primary book I read—was a book that was popular at that time called A Primer in Post-Modernism by Stanley Grenz. Kimball: And, I mean, that was kinda—probably was as depthful as I personally studied it. Um, but what it allowed me to do was—I was in a—I was in a great, Bible-teaching church; um, th-the pastor’s from Dallas Seminary—and I’m not a, I’m not a dispensationalist in that way, um, as ma-as the pastor was at that time—but, you know, but the core theology and everything of the church was, w-was there. But what I noticed was I started listening to the local natives—so to speak—of, like a missionary does when they go to a, a new town, or whatever, and I started listening like, like a missionary would to local natives, which being th-a-the next generation. And I started realizing that there were some aspects of how we went about church that did need deconstruction; so I actually was deconstructing methodology of church to say, “Why do we, you know, why do we give a sermon particularly like this? Is it from the Bible or did it develop through history in certain cultures? Why does—how does a church leadership structure—and I’m not just talking about a church having elders or a church having, you know, shepherds and that; I’m talking about, like, almost tones of leadership—a CEO model, a, um—how you define community in, a, one culture might be different than how you define community in another culture. And so, those were the types of things about the local church that I, I was deconstructing. Kimball: In that way I found that very helpful because it was like, “Why do we do what we do here?” And, if you were a missionary going into another culture would you then deconstruct, you know, um, American suburban, ah, methodology of church and wouldn’t you deconstruct it so that when you went into another culture you were then—again—keeping your doctrines, but you were then reconstructing, ah, how you would go about the mission in a different, specific context. So, in that way, deconstruction was a good thing. Ah, but again, in my particular experience it was all about, you know, ah, tones, defining community, ha—what does membership look like? How does—what is spiritual development look like for a 21 year old versus maybe a 60 year old or a 50 year old? You know, ah, how’s their thinking? What about learning styles; a lot of the stuff that, in the church that I was at, was not necessarily spoken about, and I think that’s why it was losing connection to the ext Generation; and so that—in that way I found deconstruction very helpful. Rosebrough: Okay. So you-you-you basically created a “missions” church is what you’re saying to, to people who had more postmodern ideas and that grew up in the Gen X culture. They, ah—I mean, ah, I mea-I’ll be blunt—I’m very different, ah, than my mom is, ah, on many different things; there are certain things that are key to me, that ah, my parents didn’t, ah, really share values-wise. In fact, I think I’m more, I have more in common with my grandparents than I do with my parents when it comes to some cultural values. Is that what you were finding when you were, ah, doing your deconstruction of church methodologies? Kimball: “This is the best instrument of all”; when initially it was fought to be-to keep—ah, to be kept out. So I think you’ve got to be always thinking like that, never assume what we’re doing is even Biblical. You always have to go to the Scriptures to say, “What is—is our methodology, ah, in alignment or is it—is there any disharmony with Scripture? You always have to go back to the Scriptures to say, “Can we change forms of how we go about are the—on the mission?” And, and then that can then shape it as long as we’re not compromising Scripture. Rosebrough: Nn-kay. Let me, ah, let me see if I can translate this into Lutheran-speak, cause I’m a Lutheran. Um, we—ah, the congregation that I’m a member of here in Indianapolis, ah, they have a missions church that they support financially in Haiti. And, ah, and we have teams from our church that, ah, visit our mission church in Haiti, ah, several times a year; and when they bring back reports, and show the church service that takes place in Haiti, ah, it takes place pretty much in a building that doesn’t have any walls, has a dirt floor, some, ah, cobbled-together chairs, ah, something that looks like an altar, and, ah, they don’t have an organ, they sing pretty much a capella with a drum. And yet, we embrace them as a missions congregation, yet culturally their songs—even though they may have the same lyrics—ah, they’re, they’re sung in, in Creole-French, and, ah, done a capella without, ah, without an organ. Um, i-is, I mea—is—an’ it really reflects more of the Haitian culture, ah, than the American culture. Yet the core in the liturgy, and the Gospel that’s being preached, is the same Gospel; the sacraments that a-are being administered are the same sacraments. Um, i-is that what you’re trying to describe here? Kimball: Yeah, a-a-absolutely! So say you’re to bring that same context, [clears throat] or that same, that same methodology of people sitting on the floor, and a bongo drum, right; and you brought that to, to ah, Indiana—where you’re at now—and then plopped into a building here, and the same thing was going on and then people could come in—depending on your circles—you know, an’ say like, “That’s so disrespectful; they are using, a-a-an instrument that has demonic origins of jungle beats; and like you know, that stuff you read online that can be a thing—“Look what they’re doing that’s—or look at, ah, um, look at—w-why are they disrespecting things? They’re not sitting in rows of pews; they’re choosing to sit around in a circle.” Whatever it might be, like, then you, then you hear criticism, and make assumptions, that those things that people are seeing from the outside are disrespectful or—because you’re not doing it in the, the way that maybe, traditionally, a-a church or a denomination—or someone grew up accustomed to—and then that becomes a threat and then all of the sudden, you know, “They’re not following God. They’re not following scripture.” And, these criticisms can arise because of those very things. Rosebrough: Nn-kay. Well, l-let me take—le-me-let me push it a little bit beyond that because there were some who adopted these more Gen X cultural trappings in their church services, ah, changed the name from church to cohort and then went, ah, and then began deconstructing Christian doctrines itself. And ah, it was very clear early on, ah, that, you know, who some of these folks were, and tha-they, they were not just stopping with methodology, but they were rethinking Christianity itself, ah, and the very Word of God and the doctrines that have been confessed by the hoor—historic Christian faith. Would you think that those went, those folks, you know, went beyond, ah, Christian liberty and freedom in that sense and, and were beginning to deconstruct things that have no business being deconstructed? Kimball: Yeah. Uh, I’m, eh—again, i-it’s the same thing I’m talking about. I’d always—every time we say, like, you know, “those folks” or “this group,” you always want to look at each individual, each individual church, and do that. And I’m—understand exactly what you’re saying. An’ I, and for me, that is why—see, how you view—this is why we, we also started a, ah, a new collaboration and I ended up partnering with some other, um, church leaders is because, you know, how you view atonement also, you know, is how you then view salvation and how you think of evangelism—how you, how you determine, you know, someone’s standing with God. Therefore, how important is the act of Gospel, you know, proclamation—and proclamation can be in different ways that you do it. You know, but it—drive—I’m driven, an-as I think you and I have talked about, I’m driven because I was a sinner saved by grace, putting my faith in Christ and He took on my sin on the Cross, rose again from the dead, you know. And the grace and understanding and thankfulness that I have for that, I then, am passionate to see other people experience and know, you know, know Jesus and what, what’s Biblical. And I say Biblical cause someone else in a different group would say, “Well no, I have the Biblical Christianity.” “No, you have the Biblical Christianity”; so you—even when you say Biblical Christianity someone else will say, “No, um, the way I view it is Biblical Christianity.” So I’m now deconstructing what I just said. Kimball: Well, I’m just passionate for people to see Who Jesus is and not, and, and, repent and all of the things that the Lausanne Covenant talks about; and I’ve never—I think for me—I’ve never changed in that way. So I have I—if you would have talked to me in 2002 or 2003 or 2004, probably what I would be saying to you then would be much the same with core doctrines—though now, I would be like, “Oh, I can see how this might be interpreted differently,” or when you’re using, you know, like—I wrote an article once about a labyrinth; and I know that’s got a lot of flak. Leadership Journal talked to me about, um, they said, there’s a-a group publishing, which is out of Loveland, Colorado and it’s a reputable publisher, it’s a pretty conservative evangelical publisher, put out something called, A Prayer Path—and that’s what it was called Prayer Path—and, ah, an’ they set it up at a conference and said, you know, “Dan, would you write a-an article about it?” And so I’m like, “Sure.” And so I went to this thing—never been to a labyrinth before—went to this thing at the conference and you walked into a room—and they did have—you know, I looked, I looked in the room and like well, “it looks like a maze or something” because it had tape on the floor. And then you walked up to one and then you listened—ah, some of them were recorded, some of them were written down, you know, and it’d be like, you know, “Jesus said this.” And there’d be some Scripture about something, and it would be a question it would ask you at one particular station of this prayer path and it would, you know, be just like, you know, ah, “He, He, He died for people across—”; I’d have to go back exactly what the questions were, but each one had some sort of question that was very, you know, Scripturally based or it—it, you know, “What’s the static in your life that stops you from taking time to pray?” And you sit there, like, “Huh, I need to think. What is—I’m so consumed with my Mustang right now and I’m so thinking about that.” [Rosebrough laughs] “I need to just stop, and then, maybe take some time to pray.” Like, it would just ask you questions. And, I wrote this article and then all of the sudden—I-I had no idea that it was such a controversial thing—and then all of the sudden, I’m a mystic, because I wrote this article about a prayer path. And then a woman, who I even know personally locally, who was having, um—w-who is, ah—um, ac-not even part of a church locally, wrote a response article that was absolutely—ah, an’ I use this word, um, nicely—but just pretty crazy to read the response of how she was interpreting everything. So you, um, I ju-again, you always have to look at things—so I’d have probably said, “I don’t know—I have—what’s the roots of this? I don’t know. All I know is that right now I am, ah, I am praying, there was Scripture, there was a Bible open in the middle of this thing” and, um, that’s what I wrote about. Rosebrough: All right. We’re gonna pause right there and, ah, pay some bills and when we come back we’ll continue with, ah, my interview earlier today with, ah, Dan Kimball of the Emerging Church and Vintage, ah, Faith Church in Santa Cruz, California. If you’d like to email me regarding anything you heard on this edition or any previous editions of Fighting for the Faith, you can do so at my email address talkback@fightingforthefaith.com or you can ask to be my friend on Facebook, it’s facebook.com/piratechristian, or you can follow me on Twitter, my name there—pirate christian. We’ll be right back. Well, while we’re on the topic I wanna—I wanna, uh—talk about Lectio Divina a little bit. And lemme me, lemme ah, give a—a just a smidge of history here because, um, I wanna make sure that ah, we’re dealing with similar definitions. Lectio Divina, as it has historically come down to us, has come down through Roman Catholic monastic mystics. And the, and the practice i-itself historically, basically—it’s not just reading Scripture it—you can randomly pick a passage in the Bible and you’re supposed to kind of scan it until the Holy Spirit supposedly makes particular words “pop out” at you; and once those words pop out at you—supposedly by the work of the Holy Spirit—you repeat those words over, and over, and over again, much like kind of a mantra is used in Eastern mysticism to help you get into some kind of an “altered state of consciousness” whereby then you can experience the presence of God, so to speak. Um I-i—wa-i-was that your understanding of Lectio Divina; and was that what you were promoting in the early days of, ah, of ah—you know, your—mm “tinkering with” these different Vintage Faith practices? And ih, you know, if so, ah, why? If not, then why? What was your understanding of Lectio Divina? Kimball: Yeah, let’s go back to ah, um, (pause) being on mission in a particular context. So I’m listening to people who, ah, are saying, y’ know—the contemporary—I’m not, ah 20 year olds, “I’m not—I’m not connecting with the contemporary church. It feels”—I mean these are the very words—“it feels like a Tony Robbins business presentation,” I can remember that, “like a pep rally.” Um, “ There’s no time to slow down in this worship gathering; it’s just like, you know, five songs, video clip, move—move,” you know, and I remember listening to that and then hearing about Lectio Divina; and the Latin word means “Holy Reading.” And I was reading the Scriptures, so I’m like, “Wow.” I was at a—I was with about six or seven people once in Colorado, and someone said, “All right, we’re going to do Lectio Divina”; and they opened up to a passage in Scripture—I think it was th—I think it might have been the Psalms, I’m trying to remember, and they, you know, it was like “all right.” And I’d never heard of it before, but then that’s what it was called; sit around in a circle and someone just starts, y’know, and they’ll like open up the Bible and they read a section—I’m opening up my Bible right now—and they read, say, “Psalm” and it was “The Lord lives. Praise be to my rock. Exalted be God my savior.” That’s Psalm 18:, ah, 46. And then, they’d pause for a moment just like that and they’d say, “The Lord lives. Praise be to my rock. Exalted be God my savior.” Er an’ I think they read two or three verses and then w-went around the circle and I’m like, “You know that was refreshing!” We didn’t, you know, w-there was no mystical chanting, of like, losing your mind—it was—you’re reading a Bible verse, three or four times, and it was—it was actually—and y’what I, what Irealized was it was just you were calming down for a moment, in the rush of meetings, and stuff that you were about to go into; and I’m like, “That was, that was, I loved reading Scripture.” It was not the “emptying of mind” or’s going into some weird, meditative state of, you know, whatever. It was, y’ reading a Bible verse three or four ti—what the heck was wrong with that? And that was my experience; and how I defined it as “Holy Reading”—from Latin words—and actually found that it was a refreshing time, like when you pause in a worship gathering and you read a Bible verse or two or three, you know—two or three times before you might even teach it, or as quieting your heart and reading a verse three or four times. So that is what—how I defined it, and practiced it; and then heard later that, you know, it’s about—that some people—and I’ve never, I’ve never experienced it at any worship gathering or any person that I’ve seen do it where you’re, w-you know, you go into mindless chants and you’re—goes on f—I’ve never experienced anything but what I just did—reading a Bible verse three or four times and, and that was it. Rosebrough: Nn-kay. Well, one of the things that’s part of my daily, ah, practice is, if you—I hate using the term like that—but, ah, if you follow me on Facebook or Twitter then you know that, ah, I frequently send out, ah, readings for the day in the Scriptures, and there’s three Psalms; and, ah, one of the things I’ve been doing for a long time is praying the Psalms. And so I have a Psalm in the morning that I pray, I have a Psalm that I pray at noon, and I have a Psalm that I pray in the evening. And, ah, it’s not just a couple of verses, but I-I-I try to pray the whole Psalm. I-i-i-is that—does that sound similar to what you’re talking about? Kimball: Yeah, see you’re practicing Lectio Divina. Rosebrough: Oh no. (Laughing) See, you’re gonna get me in trouble. Kimball: Psalm 136. Right, you know? It says, “His love endures forever,” you know, I’m counting it right now—one, two, three, four, five, six, seven, eight, nine, ten, eleven, twelve, thirteen, fourteen, fifteen, sixteen, seventeen, eighteen, nineteen, twenty, twenty-one, twenty-two, twenty-three, twenty-four, twenty-fi—twenty-six times the same thing is repeated in Psalm 136. Kimball: (interrrupting) But then, but what’s my point is then, you’re saying the same thing over and over in there, right? Rosebrough: (interrupting) Right, but it’s not to get you into an “altered state of consciousness” to calm your monkey mind down or something like that, though. Kimball: Or our church. Uh, but there was, um, I remember, you know, like three years ago—four years ago—ah, something like that, there is, uh—after one of our worship gatherings on a Sunday night, there were two students from Masters College and, John MacArthur’s university, and they came up to me after, after Sunday night and like, “You know what? We gotta’ apologize to you.” And I’m like, “What?” And it’s like, “Yeah, we’re, we just did a whole, week-long emphasis on the Emerging Church in our school,” and, and I’m just being blunt here beause I think this needs to be addressed, is that, and they said, “all of these things—what you would be doing here and we came here and you preached for 45 minutes, people had their Bibles, you—you did some songs that were hymns and, and contemporary songs. You’re ah, and like, it was nothing like we were told this Emerging Church was supposed to be.” And they felt bad cause they came up hoping to see some sort of chant, you know, mindless—I don’t even know what they, you know, what they were expecting—but it was just fascinating to hear that. Or, another guy named Matt Slick—I don’t know; do you know him? Rosebrough: Yup, I know Matt. Matt’s a friend. Kimball: From CARM Ministries. C-A-R-M, I forget what that acronym stand, like he shows up on a Sunday, comes into our ch, you know, and I’ve since gone on to his website and he is very, very, uh wh—I don’t know what the correct term would be—but he is very blunt in saying things like he sees them. And, uh, and he came to our church gathering, y-eh, and we happened to be talking about salvation through Je—I’m pretty sure it was—I think it was salvation through Jesus alone that night, if I remember right; but he, you know, so then we end up talk—and he wrote a—you can go on his website and he wrote an entire review of his experience at our church. And what I respect about that, or respect about when we talk or respe—is that then people actually take the time, if they have concerns or questions—I know they can’t travel around like you do cause it’s your vocational sort of ministry, but they certainly could call up th-a church or just wonder be—wonder sources, about things, and so that’s what, um, you know, I think that’s—that’s ye-th—so when you’re saying like, you know, there’s a—whether it’s Lectio Divina, sacred reading—holy reading of Scripture—if it’s practiced like Psalm 136 and you’re saying a verse or the same thing over, that’s not—that’s not—I can’t see how Christ would be displeased with, with that. Kimball: —once again. We believe in invisible angels, and invisible demons, you know, like these things—and they can appear—but I’m like, we b-, you know, we’re not just—there is a sense of myst—ah-ah, I don’t wanna misuse the word mystery because, you know, it we’re—it’s a-you know, um, it’s not just a scientific, mathematical existence that we have when you’re speaking of the risen Christ and His Spirit in us. So there is a sense of our lives are, ah, more than just flesh and blood in that way and tangible things you can touch and knock on; so I, ah, ah, um, n-not sure if I even made sense or what, or why I said that part of things, but I think you have to define what is mystical, ah, i-i-in many ways. Rosebrough: Let me read this, it says: “We affirm that there is only one Saviour and only one gospel, although there is [a] wide diversity of evangelistic approaches. We recognise that everyone has some knowledge of God through his general revelation in nature. But we deny that this can save, for people suppress the truth [by] their unrighteousness. We also redrec-reject as derogatory to Christ, ah, and the gospel every kind of syncretism and dialogue which implies that Christ speaks equally through all religions and ideologies. Jesus Christ, being himself the only God-man, who gave himself as the only ransom for sinners, [and He] is the only mediator between God and people.” Y-y—so you subscribe to this; tha-that’s what you believe—you-you don’t believe in universalism? Kimball: I-I have, y’know, you can go back, um, to my entire ministry vocational year—pre-emerging church—whenever, I-I teach the same…ih, I’ve…tha-that’s the only thing I have taught. Um, I’ve never taught something different than that. So, y’know, or believed—and so to say—y-and that’s, like, when I get upset inside; y’know, the way I get upset is I don’t internalize it mainly, but, y’ know, when someone says, y’know, “Dan you are a universalist or you think—” I’m like, “Can you show me where I have ever said that? Show me in anything I’ve ever written or in my teachings or, y’know, a-anything at all that you can ever say that?” Because that’s a major statement to start saying about somebody, y’know—and I had this—like, let me—jus’, I’ll give you another experience. There was a major, y’know—there’s like y’know—two or three major discerning kind of websites, and then one particular one, they said something that was accusing me of universalism and, ah, an’ be-an’ thinking all paths lead to God. So I took the time, an’ actually, ah, se-I called up the person on the phone, and then I said, “Uh, I wanna send you my actual PowerPoint teaching notes from our church; what we used, and my notes,” and sent it to this, this group of, of—that run this website. And then end up saying—then after they saw it said, “Well, you know, like”—they couldn’t—like, even when they got the facts of what I taught, and showed them here’s our-the notes and the PowerPoint an’, an’ why, why don’t you even read a chapter from one of my books where I actually make a whole case of how to explain to a—someone outside of the faith—that all paths do not lead to the same God; I had a whole chapter about that. Kimball: And they ended up saying, “Well,” and they— “you still hang out with people, so you need to take back all of your books” or something, and, like, I’m realizing—that y’know, I don’t even know if I can have conversation with, with certain types because it almost seems like they don’t want to know that what they’re thinking is not true; there’s sort of a, a frenzy of, y’ know, of, um, of—I don’t know what the word—delight in finding things that are wrong and then they don’t like to discover that maybe they are wrong about what they’re thinking are wrong. That’s why I have appreciated, you know, w-our time that we did get to meet cause you’re asking me questions; and I was delighted to respond to you. And we had disagreements, y’know, about things, of course. Kimball: Um, you disagree with my methodology, or the Druckerite stuff, and all of those things; but, y’ know, a-an’ but I can st-I can still say, “You know, but we still believe in Christ, th-the things in the Lausanne Covenant, and, an’ these core, or central, doctrines of the historical Christian faith.” And, um, so that’s—so when you’re answering a question about that I’m like, “Absolutely!” and I just wish that if people do have questions that they’d finally just ask somebody rather than, ah, make these assumptions that aren’t necessarily true. And I think it’s rampant in these particular discerning type of websites. So, ah, I just—wo-I just, y’know—Jesus—I’m giving my little—maybe I’m now off topic, y’ know, but Jesus said in Matthew 12, “That out of the overflow of the heart the mouth speaks”; and “people will have to give account on the day of judgment for every word they have spoken.” And I would say that, y’know, out of the overflow of the heart the fingers type; on blogs, and on websites. And, an’ I believe that we will have to give an account for everything that we have said; when we tear down a brother or sister in Christ—I do not—without justifying it through facts, I think there’s gonna be, in my—ah, ah, I’m not, I’m saying this aga-with—in a general sense—I just think it’s a shameful thing when—if I was to do that against someone else, or if someone else does that against others. So. Kimball: (interrrupting) Not a Universalist; that was a long answer to your-osebrough laughing) to your short question. Rosebrough: Yeah, I-I-I-I got it. I, y’ know, in fact, I-y’know—it was pretty clear, ih, back in 2008 when you were subscribing to the Lausanne Covenant that, ah, if you were a universalist then there has to be some new and improved definition of universalists that includes people going to Hell. Um, ah, which, by the way, i-i-i-you believe in Hell, right? Kimball: Yeah. Um, we—I mean—this is another thing. I-it’s so funny to read things. We preach on Hell, a sermon about every single year in our church. I was just down at the Outreach convention in San Diego. My whole topic was teaching emerging generations about Hell. Last night in our own church, I’s reading the horrific, uh, sounding verses, y’ know, about judgment, in, uh, 2 Thessalonians with—y’know, about being “shut out” from the presence of, of, y’know—tha-He will punish those that do not know God and do not obey the gospel of our Lord Jesus and they’ll punished with everlasting destruction and shut out from the presence of the Lord and from the glory of His might. Y’know, an’ I was pleading with our church last night. I’m like, “These are difficult things to hear and say, but we have t”—I-um-I am, I’m passionate to talk about it. But then I’d deconstruct—an’ this is important because someone will say, “What Hell are you talking about?” Y’know, um, I believe we need to deconstruct, you know, Dante’s Inferno and the images of Hell that have come up through artistic poetry and not based out of Scripture. Kimball: Or that we ha—because most Americans today, when they say, “Hell,” they’re thinkin’ of a cartoon sort of Devil with horns, and that, y’know, he runs Hell. Ah, and so I think what our job is, is to also deconstruct what Hell is culturally; an’ y’know, Satan is not ruling Hell, he would be in Hell. Hell was created for, for Satan and his angels. So I think we have ta teach correctly what it would be, but then deconstruct what the average American may think of it. And so, I’m passionate about that because I am so grateful that I am saved from Hell; and that compels me to wanna share that with other people. Kimball: I don’t use Hell as my driving force of evangelism, you don’t see th—I don’t think—the-there’s judgment talked about in Scripture a lot; y’know, but I, ah, we speak about it, we teach about it, an’ I—we have to teach about it; so. Rosebrough: Right. (pause, sighs) Ah, ahem; you know Dan, I-I gotta’ tell ya—I, you know, i-it’s been, it, well, a-as we were talking about these things, you know, it became so clear that, ah, that you’re true to your word in, in really, ah, proclaiming and defending historic orthodoxy; that, ah, when the Scriptures say that, “there is no other name given by what we must be se-saved,” you give a hearty, “Amen!” And then when, eh, the Scriptures talk about all men and women are perishing because of sin, but God loves everyone not wishing that “any should perish, but that all should reach repentance, “ that you again, you give hearty “Amens” to all of this sound, Biblical doctrine. So, th—he-here’s the question I have for you—and I think you saw some of this—is that when I came out and I said, “you’re, you’re my Christian brother,” um, y’know, ah, that became a lightening rod—and there were plenty of people who, y’know, came out of the woodwork and weighed in on the subject—and what I saw is, is, that all of the sudden I was experiencing guilt by association. And, y’know, th-the emails that I received were—uh, ah, a-at times—it didn’t really make any logical sense, but emotionally they made sense, eh, ah, ah, because of, y’know, th-there’s a strong feeling of betrayal in the, in the Body of Christ as a result of some of, ah, some of the heresies that have come out through the other,eh, through the other wing of the Emergent church. Um, but at the same time, th-the, y’know, I-I got to experience some of what you go through on a regular basis. So here’s my question for you, I mean, if you could do it all over again—kin-na-knowing what you know now—what would you do differently? I mean, y’know, eh, knowing what you know now—and you had to live through the whole experience again, what would you do differently, ah, y’know, in light of all of this? Kimball: I would say, what I, um, what I would do differently? I would (sighs) I think—well one thing there was—and at first I agreed with it like, “Well, we all, we all just focus on Jesus; we shouldn’t write out a doctrinal statement because doctrinal statements divide,” or something like that. And initially that sounded very, um, y’know, “Man, we’re all about Jesus” and, and I understand that, but then all of the sudden—if you’re not starting to ask definitions—how do you define the gospel? How do you define Jesus? How do you define salvation? How do you define Hell? How do you find atonement? An’ what you—I-I-I eventually say, “You know what? We-we are all about Jesus”; but then you do have to be more explicit in definition of, of, of things. So I probably would go back—and um, I think maybe my naiveté to some degree was assuming everyone be-believed, and I’m not just talking about just Emerging Church guys, I’m just talking about in general; everybody still had the same kind of core doctrine stuff. So I think, um, I might have been more explicit in defining things more, and the assumption that we’re all talking about the same thing; when little by little you can still use terminology—but it could drift into different meanings and it happens slow—uh, ah, so I think that was probably a big thing I would have changed maybe in my own experience, ah, more. Bu-I-I, Iam so glad that the whole—I mean the Emerging Church, as in 2003—in that time period—but, ah, the church is always going to be emerging; y’know, there’s not like one, Emerging Church. The church is emerging now; the church was emerging in the first century, the church is gonna be emerging in, in 50 years. And I think our—I hope that when we’re—when we sit at, an-and face Christ face-to-face an’ He’ll be like, “How did you serve Me on mission well? Did you worship Me?” “Did,” y’know, “Did you worship”; but, ah, I want to always be emerging. Y’know, eh-so, I think, uh, that’s what I’d do differently, I think. It’s probably not—is be more distinctive in asking certain questions about certain doctrines directly because you can say words, but what do they mean underneath those words? Kimball: That is probably the biggest thing I would think of. Rosebrough: So, eh, to summarize it, you would, you would have been more explicit on the definition of some of those terms. Kimball: Y-yeah, cause you can say, “I’m into evangelism, “ but then ask yourself, “What exactly does that mean?” Or I’m into, ah, I believe in the Gospel,” then mi-, you know, say, “What does that mean?” So I think you have to do a little more defining, ah, today than before. Rosebrough: Okay. Y’know, I-I agree, I think you always have to define terms. Okay, so, ah, y-y-you believe Christ is our only Savior, you’re not a Universalist, you believe in Hell; and ah, we talked about this earlier an-an-and that is, is that, you know, every time, you know, one of the things I do is, you know—and this is terrible cause this is like so not postmodern—but ah, I have a tendency to wanna categorize things, you know, I—there’s certain theological categories that I think historically work out well, but every time I run your theology through ah, y’know, my category—my category machine, I end up coming with you being somewhere in the general Reformed camp. Ah, yet some eh, eh, some form of ah, Calvinism. Is that—is that correct? Is that a—is that a proper understanding of your theology? Kimball: I’mean, I-I don’t identify myself as a Calvinist i-in that way. And I think I—Os Guinness, um, spoke at our, ah, Young Adult ministry once. And he came in an’ someone asked this question about, you know, the five points of Calvinism and election and different things, and he said, “You know, um, there are Scriptural passages that teach—that teach both spectrums of this,” y’know, and he’s like, “To spend, ah, much time on it”—and I think he used the word “silly,” and I mi—I wouldn’t necessarily say silly, but I-I would say, like, “Man, I know the Scriptures, making your answer.” I wouldn’t say like, “I am a Calvinist.” I w—I would be a ah—I would say my belief is there is those God has elected—and that’s what the Scriptures teach—and it seems like there’s also Scriptures that teach there’s human choice as well. And I love the book that Norman Geisler wrote—and I know maybe some of your listeners don’t like him, I don’t know—b-he, but he wrote a book called, Ch—uh. what was it called; Chosen uh, Free, But Not Chosen— I’m tr—I’m forgetting the name of the book—and I read that and I’m like, “I love the way he put it here, cause there’s a tension here. [note: The book is called Chosen But Free] So that’s why I don’t necessarily identify, “I’m a Calvinist or I’m not a Calvinist” in that—in that way. But, I wanna—I liked what Os Guinness said and the way—and the tension of the Scriptures about those very issues in there. Kimball: (interrupting) I am born—I am born an absolute sinner. I-I am a sinner. I am not saved, um, y-y’know, a-apart from Christ and so I am a, I’m a depraved sinner. I tot—y’know, s-so if that’s what you’re asking; yes. Kimball: That’s the rest of my life in that, y’know? Rosebrough: All right. So, this is a question—this is a standard question I ask everybody who comes on the program and ah, that is-is that ah, y’know, ah-eh, 2000 years ago Jesus is, ah, hangin’ on the Cross and He cries out, “It is finished!” What was finished? What was Jesus doing on the Cross? Why was He there? In your own words, explain the drama that was taking place and why that even had to happen. Kimball: He took on—He took on our sin on the Cross. And His work, ah, I mean, He was then resurrected again; but He—is His finished work of taking on our sin on that Cross and the work that He did. Um, assuming that’s what you’re asking. Rosebrough: Um-hmm. Ah, oh, y’know, y-you get to answer it any way you want (laughs). I mean, y-you could talk about, I mean, well, here’s a question for you, is there’s been a lot of controversy, ah, eh, y’know, regarding so called different theories of the atonement. Ah, y’ know, the Ransom Theory, the Penal Substitutionary Theory, and ah, sometimes I think that, ah, personally i-i-it’s, y’know, the Scriptures describes different facets of it—gives us different word pictures of it. Um, w-y-when, ah, was Jesus being punished for your sins and mine on the Cross? Rosebrough: Okay. And, ah, did His blood ransom us? Kimball: I-I look at Romans as inspired by God; I look at Paul as being inspired by God to record what was in Romans for us today, so I take those truths, and what he said there, as being God inspired and that shapes my theological view of what happened at the Cross. Rosebrough: And so all of us are dead, born dead in trespasses and sins in need of a Savior. Kimball: Yup! Never taught anything different since I have—for the 20 years I’ve been in vocational ministry. Rosebrough: Wow. (Sighs) Anything else you’d like to say? Thi—ih, y’know, anything—any other burning issues, eh, any other ways in which you feel like you may have been mischaracterized that you would like to set the record straight here at Fighting for the Faith? And I can just say, I-I think that all of this watchdog discernment ministry would maybe even have a better voice—and I think we tha-tha-there needs to be some, y’know, true looking at our own hearts and our own attitudes—including me—of, of how we respond to things. And I’m just like—uh, I looked at your-your comments—I’m like, “Man, it’s like piranhas in there; put-put your little fingert—y-your toe in there, oh, my goodness!” It’s like—an the-I had three—this is, eh, eh, I’ll finish with this: I ended up contacting offline, y’know on Facebook, three different people and I’m like, “You got any questions?” All that were either saying that I was a heretic or whatever—all three have not read anything I’ve written. They’re like, “Nope, haven’t read anything.” And the one guy wrote back and said, “I’m sorry; I, I shouldn’t be saying these things.” S-an-and I’ve even read something I’ve written and there’s, an it all goes down to these one or two primary websites; and I can say that—I-I can say this before Christ, that there are false things written on some of these websites; and that go off as “fact.” And, I have had correspondence wi-as I said, with one of them and they wouldn’t change what they had wrote even though I had showed them—and in one, they even took two of my quotes and they added editorial words into these quotes to then make their case of what they thought I was saying; and I believe that is dishonoring Christ, and I believe that is not honoring other people. Should we call out sin? Should we call out heresy? Totally, I-I-I do agree—especially in the local church context for those that you know—bu-but boy, it broke my heart reading comments on your website of how people responded to you—who care for these people; and it just—it was very sad to me reading the heart and the attitudes. And actually I’m almost getting emotional here talking about it; it’s like I don’t think—would Jesus really, y’ know—you’re a brother to them. Why are they, why are they trying to shame you so quickly on-on your Facebook? So, I-I, I know you didn’t—I didn’t tell you I was gonna even say any of that, but boy, it was just emotionally reading that. Um, and I’m not being no wimp; like, “You shouldn’t call out something!” I think you’ve gotten to know me; I’m no wimp of saying, “Don’t confront a brother in sin, or a sister in sin”— absolutely—but we should do it Biblically, and with the goal of restoration, and with a heart of brokenness and compassion; not [in] anger or self-righteousness. Rosebrough: Right; an, y’know, an let me add to that. An that is to say th-the people who reacted, ah, very strongly in the negative way, um, you know—I challenged many of them on my Facebook wall. I said, “Can you show me where Dan denied or impugned or deconstructed any o-oh-of the cardinal doctrines of historic orthodoxy?” And every time I would push for evidence to that effect, um, i-i-y’kno-ah, there was none forthcoming; and I knew that there wouldn’t be because, it-y’know, I’ve read everything that you’ve—I-I’ve read every book that you’ve published and, and, you and I’ve talked about the things that, ah, that Biblically I think that there’s some disagreement on. And ah, when we did that face-to-face it was done amica-amicably as brother to brother. And um, y’know, I think there’s a difference and there needs to be a marked difference when it comes to—ah, when we correct false doctrine the question that is before us: Is the person who is preaching the false doctrine—eh, y’know—or they have a difference of opinion—does this touch on a cardinal doctrine of the Christian faith; yes or no? Is the person who is preaching this a brother in Christ who may be erring; ah, yes or no? These are important things that have to come into play because there’s a difference between restoring and correcting a Christian brother; and there’s—ah, and rebuking somebody who is faa-flagrantly mishandling God’s Word and teaching false doctrine. And ah, what I’ve found in my conversations with you is a marked difference; is ah, is an openness, and willingness, to hear a different point of view; and ah, and a willingness, an-and an openness, to being corrected and to being shown—if you’ve done anything wrong—because I ah, when you say that you would repent, I-I think you really do mean it. I me-I don’t—there’s nothing in our, in our conversations, either in email or face-to-face, that would, ah, that would make me believe that, ah, this is some kind of a ruse on your part just to make me think that you’re orthodox so that you can somehow “smuggle in” ah, Emergent heresies; I don’t see that at all. Kimball: Ah, a-and probably the difference would be like my-my temperament, and my tone, is different than oth-than maybe yours or someone else’s, and so you can’t also make judgments by, ah, someone who has a mission in their approach and their tone about something. Or, we—if someone out there said, y’know, like last night as I preached an-and spoke, ah-ah, we had, y’know, an artist who’s creating an art piece on the side of the stage; y’know, i-in-in-that’s collaborating with what I’m talking about. And someone may say, “That’s wrong for you to do that”; and I will defend doing that. I will say, “It’s not breaking Scripture, it’s actually helping people learn that are more visual learn—I mea-you’re involving someone else in the church into the creative process of-of proclaiming truths through this art piece.” And we may disagree about something like that; and I’ll say, “An’ we can argue about it,” and I’ll say, “I-we might have differences,” and I think—an that’s alright. But if what I was teaching about was against some, you know, some sort of core historical doctrine of the Christian faith, then I’ll say, “Man, call me out on that!” And also like—I-I shared this example with you when I met, we met—was on another one of these websites; I was accused of being a witch, or something like that. And it was like, “I had a salt crystal.” I’m using this for an example because these are examples—I’m trying to show your listeners of how to properly discern what is accurate in these things. And ah, it was like, “A witch agrees with Dan Kimball”; or something like that, on y-on one of these websites—and I’m reading the article and I’m like, “Oh my goodness.” Here’s what we actually did. We spoke about—we were teaching some Scripture about “being the salt of the earth,” and, y’know, “being the salt and light”—what Jesus was talking about. And then we had a world map that was out on—we laid out on a table—a couple of world maps because the church is too big to just do one, and then we had salt crystal—like actually, a Morton’s salt crystals; big pieces of salt, ah, actual salt, an, and just said—cause there’s some people that tacti-will learn through “doing something” y’know, tactile-wise. Kimball: And they, and we walked up to it and we took a salt crystal—the Bible verse is right on the table about being salt of the earth—and they would place the salt on a country and then prayed for the Christians in that country to be the “salt of the earth” where they are. And then I’m reading that and I’m like that—that gets equated to witchcraft? Or you know, and then seeing like a little frenzy of like, “Witchcraft!” And I’m like, “That-this is not good. I can’t imagine”—you-they might not understand that cause for them putting a salt crystal, a piece of salt, eh, on a map, it’s wrong? Y’know um, and you’re praying Script—y’know, it’s like—I wish people would tak-have enough intelligence to actually think through some of these things to see if it is true or not; and not—and I feel bad cause, y’know, like grandpas and grandmas that read this stuff and they’re like, “It’s crazy!” Wh-y’know, I’m like, “Boy there’s”—I-I believe that some people will be held to account of how they have represented brothers and sisters in Christ. An I, an I, I-I think we better clean that up; and I hope you do, too, and I do, too; if-as I speak of someone. Should we still call out if there are false doctrines, if, if we’re going outside of what the-we believe the Biblical doctrines of the faith are? Absolutely! I keep saying this, call me out at any time on any doctrine. Kimball: Call me up. Email me. Ah, say, if I don’t repent, post something on the blog, I don’t care; but do the homework to see if what you’re reading is accurate, or not, before you come to a judgment. Kimball: (interrupting) Yeah. I think you should do that with other—other [of] these discerning websites; we need to start looking at some of these articles that they have written and start doing the same thing about what they’re preaching, in addition to the other people that you’re looking at. Maybe we do nee-maybe we need to do some self-evaluation of those that are holding the-the “Guardians of the Faith” y’know, attitude an-and things. And I think we need to guard the faith, we need to guard doctrine, and then start doing the same with some of them. I don’t know; I’m jus-eh, I think we need to do some self-evaluating here with, with this stuff. Rosebrough: And ah, the idea here is that there really, truly is bad teaching and doctrine out there. And ah, y’know, the lesson that I’ve learned in-in y’know, my first impressions of you, to a “cleaned up” impression of you and your willingness to communicate to me the truth an-and give me more data so that I had an accurate view of you, tho-the time that you took to meet with me personally and allow me to ask you tough theological questions—and to challenge you on some of your methodologies—and, and the humble attitude that you’ve taken, all led me to conclude, ah—contrary to what some people have said—eh, that you’re not a heretic, you’re a Christian brother. And that our posture towards you needs to be one of “if there’s something that you’re doing wrong that we think is Biblically incorrect,” then the posture needs to be of re-of restoring and correcting a brother, but not throwing you under the bus or lumping you in with a group of people who are attacking, impugning, deconstructing, denying, and obfuscating the, ah, what Christian faith is; because over and again in my conversations with you, you affirm that Jesus Christ is the only way, that He died on the Cross for our sins, that there is judgment. And tha-and that we need to—an that there needs to be ah, passion and an-an urgency in reaching people with the Gospel; I mean, I even got that out of, out of the, ah, book that you wrote about in the book They Like Jesus but Not the Church, and the video teaching you’ve done along that line. Over and again, I see somebody who’s passionately challenging Christians to find a way to reach those who are going to Hell with the Biblical Jesus and ah, and not another one. I thought it was unique on your part that you see that ah, even the distorted views of Jesus that are out there in the general culture create a common ground that we can then, ah, use to, ah, teach people about Who Jesus really is. Kimball: Well, um right—and I even saw that someone on your website, or your Facebook, posted a clip to the They Like Jesus interviews that I did; and started mocking it and saying, “Who’s the”—you know what? How would a missionary go about their thinking? And you don’t leave them with the—the ah, con-the book They Like Jesus from some of these people that have never even opened it, the “they” in They Like Jesus, but Not the Church are those that don’t know the Biblical Jesus. Kimball: Ah, Christians—in that sense that—tha-ah, though there’s probably Christians—understandably—that don’t like certain churches too; but the-the thrust of that whole book, and those interviews, are all about as a missionary goes about and listens to people’s opinions then you respond in a strategic way to whatever culture you’re-you’re doing. And, that’s what that is and it’s just so funny to watch reactions about things, wha-w-in that way; y’know, if they’d open that book they’d read I have two pages on Who I believe Jesus is—that I’m—you’d probably sit there and say, “Amen” to the whole thing. Um, and it’s not—and I don’t want this whole thing to be just about “Dan Kimball” here. There are people on a lot of these discernment websites that I—that are in the same, uh, same situation as me—who I know their churches, I know what’s going on behind the scenes, and they may have a missionary context of how they go about things that then may cause suspicion by these certain discernment groups, but then when you do ask them you’ll find out like, “Oh, they do hold the cardinal doctrines of historical, orthodox faith.” And, y’know, I just think you have to be careful in how-how you go about doing that until you’re evaluating it correctly or evaluate by ah, about not just the surface things; it’s very important. So it’s not just me who these people—I’m defending myself to some degree and our church, cause I represent our church, ah—I also think, y’know, it’s not just me who I’ve watched—people get torn down an I-an I think un-unJesus-like and unscriptural and untruthful ways out there. So I hope the discernment groups will rise up to take a little more accuracy in-in how they go about things; and a little more heart and Jesus-like tone, in how they go about things. Never avoid the truth, but make sure when they’re saying truth that they understand what the truth is they’re even talking about. Rosebrough: Right on. Couldn’t have said it better myself; but then again, I guess I’m just a heretic now that I said, “Amen” to that, so (clears throat). Sorry, nah, that was an overstatement; but—Dan, ah, I-a-again I-I can’t thank you enough for your time and for your generosity with your time and for your candidness in, ah, coming on the program. And ah, y’know, I understand you’re gonna be taking some time off, and ah, enjoying a little bit of R&R, and I ah, my prayer for you is that you will, ah, be able to recharge your batteries appropriately. Kimball: Yeah, we’re going away for a couple of weeks; it’s our anniversary, and um—loo-looking forward to it and wrapping up my next book I’m writing on and I will be, ah, have fun. And you get rest, too in what you’re doing. Rosebrough: I-I will, and I told ya I was sending you a Christmas gift, but ah, y’know, i-i-it’ll probably be waiting for you at your church when you get back from your vacation. Rosebrough: Th-ah, the address where Vintage Faith meets in Santa Cruz. Th-yeah, that’s what I meant. Kimball: That’s, that’s correct. Yeah, y’know, and I show-you sho—um, I love when you end up talking to people and do interviews whe I-when I’ve been tuning in l-lately. I think that’s the best way to go about things is talk to the individuals themselves; like you’ve been now doing and I think that is the best approach. Oh, so thank you—thank you for saying, ‘Let’s talk on the phone,” and thank you for—thank you for challenging me in the ways that you challenged me! Y’know, and I—hopefully, I challenged you back with some things, y’know. W-but y’know, it’s like we talked about some of the methodology, and methodology stems from a—there’s theology and methodology—I’m aware of that; but, ah, I look at you as a-a brother who also believes, ah, the same “doctrines of faith,” and I ho-um—same thing back. An-and please, for you too, have heart; challenge people, have heart, I mea—may your lips be of, of, one of, ah, (sighs) y’know—of love and h-how you go about things, and let’s—let’s represent Jesus in a right way in how we talk about people. Tha-be me, too; every—all of us. Rosebrough: Amen. Thank you Dan! Rosebrough: (interrrupting) I watched both East of Eden and Rebel without a Cause. And her-an her-ya—let me give you a quick synopsis: East of Eden, fantastic movie. Rebel without a Cause um, yeah I—my daughter watched it with me and we both we’re basically saying “not the best script.” And-and the fact that Thurston Howell III was his father in Rebel without a Cause, kind of distracted. Kimball: Is-a—it’s fascinating thinking of like, again, culturally that was—that movie was from 1953, 54? Rosebrough: Ah, Rebel without a Cause came out the same year that James Dean died. Kimball: Y’know, but you think the teenage phenomenon was just being “birthed” at that time in American suburban culture, so we place that movie in the context of the teenage world—y’know, there were no youth ministries at that time, there were no—even how churches function—the teenager was being born; y-and how we look culturally at teenagers, right around that time period; so, it’s fascinating. Rosebrough; Well, eh, tell you what—n-next time you need somebody to offer a different point-of-view on the whole culture thing—eh, y’know, an wants, and wants to give a historical explanation of the concept of Lex Orandi, Lex Credendi, or Lex, ah, Vivendi, eh-I’m your guy! Just wanna let you know (laughing). Rosebrough: Yeah. Th-th-this is a completely different conversation and if we start on this one it will be another hour. And, ah, yeah—no (laughs). Kimball: All right, next time we meet, we shall have that discussion. Rosebrough: We shall have that discussion next time, but ah, Dan I look forward to, ah, meeting with you again. Kimball: All right. Thank you so much Chris and have a wonderful rest-of-your-week and may we honor the Lord Jesus and represent Him as His Body in this world as we serve Him on mission. Rosebrough: So there you have it; that was my interview with Dan Kimball of Vintage Faith church in Santa Cruz, California, one of the leaders of the Emerging church movement. What I’m gonna do, if you follow me on Facebook and Twitter, um, yeah, I might even put a PDF together that has the links; um, y’know, I think I might do that, um, what I’m gonna do is I’ve ah, found, uh, the, uh, article written by Matt Slick regarding, ah, Dan Kimball. Ah, Matt Slick of, uh, Christian Apologetics and Research Ministry—CARM—that Dan referenced; [Dan Kimball of Vintage Faith] and I’m also going to send out a link to a recent article that Dan Kimball did on, uh, on “The Truth about Hell” [Teaching the Truth About Hell] and, ah, that I think will also help, ah, ya’ll in, ah, y-making your assessment regarding Dan Kimball. So what did you think? I, yeah, I told you it would be interesting and it would be challenging. I’d love to get your feedback. If you would like to email me regarding anything you’ve heard on this edition or any previous editions of Fighting for the Faith you can do so; my email address: talkback@fightingforthefaith.com or you can ask to be my friend on Facebook—it’s Facebook.com/piratechristian, or you can follow me on Twitter—my name there Pirate Christian. Till tomorrow, may God richly bless you in the grace and mercy won by Jesus Christ and his vicarious death on the cross for all of your sins. Amen.